The supply of mid-sized crossover vehicles on the market provides ample opportunities for buyers. Kia’s Sorento CUV has been in the game since 2003 and lucky buyers will have a vastly upgraded 2011 package. Previous Sorentos were built following the standard ploy of ten years ago wherein an enclosed body was mounted to an existing truck chassis. Moving into the modern era, Kia has changed all that with the car-based 2011 Sorento. 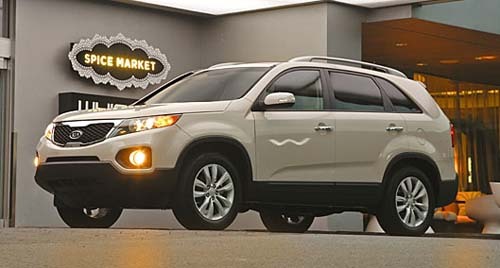 Contemporary styling allows Sorento to blend well with the crowded field. Let’s face it, vehicles in this class are not meant to be eye turners or rocket sleds. People buy these to carry family, friends, and associated supplies on a daily basis. Running flat-out along a mountain road can be done, but that’s not really how Sorento is meant to be deployed. The 3.5L V6 engine (276HP @ 6300rpm) is quiet, smooth, and able to pull well when getting onto a freeway. Around town, the engine/transmission package work very well together. Kia’s 6-speed electronically shifted transmission has overdrive and Sportmatic® modes which, again, work very well. Five doors, folding rear seats, and a high roof line make getting in and out of Sorento a simple task. We found the front seats to be a touch too high off the ground, requiring us to climb into and drop out of the car. However, this high seat position also gives the driver and passengers a clear view of the road ahead. The ride is a bit stiff, though confident, with positive steering controls and decent brakes. Fold the rear seats down and Sorento will hold 72.5 cubic feet of cargo. Front seats provide ample room and comfort. Dual zone temperature controls were unexpectedly welcome at this price range. Overall, the 2011 Kia Sorento offers good value for the price. Many comfort and convenience features, economical V6 engine, and a lot of useable interior space hits the target market spot-on.